To help users understand the purpose of specific properties of Active Directory objects, you can provide custom help text and short hints for them. The help text is displayed by clicking the button located next to the input field. The hint is displayed in a tooltip when moving the mouse over the input field. When possible, the hint is also displayed inside the field (as long as the field is empty). To assign custom help and hints to Active Directory object properties, you need to use Property Patterns. 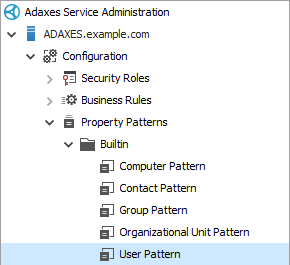 Adaxes provides built-in Property Pattern User Pattern that is by default applied to all user accounts. 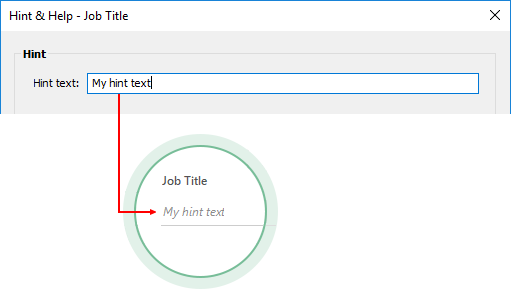 In this tutorial, you will learn how to use the Property Pattern to specify a hint and help text for a specific property of user accounts. If the property which you want to provide help and hint for is already in the list, right-click it and click Edit in the context menu. If not, click Add and select the property you need in the drop-down list. Click the Hint & Help button located at the bottom of the dialog. In the Hint section type the hint text. 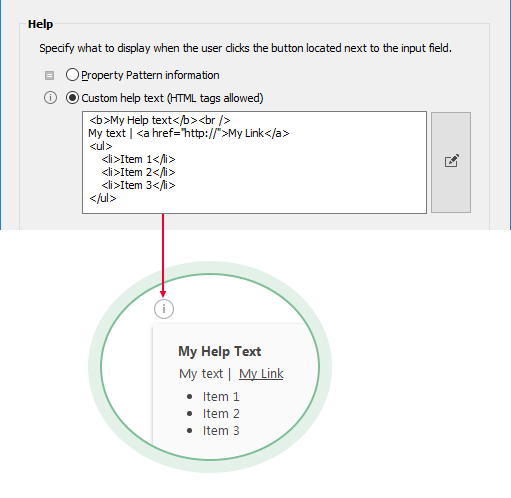 To provide help for the property, select Custom help text and type the help text in the edit box below. To edit help text in a visual HTML editor, click the button.